1. Mix the courgettes, salad onions and flour together; crack in the eggs and beat well to combine. Season, then fold into the ricotta, not doing too thorough a job, so you are left with lots of ricotta lumps. 2. 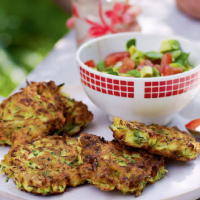 Cook the fritters in 3 batches: heat 1 tbsp oil in a large non-stick frying pan over a medium heat and drop in 2 heaped tbsp of batter per fritter. Cook for 3 minutes on each side, or until golden. 3. Meanwhile, combine all the ingredients for the salsa and season. Serve the fritters with the salsa alongside. This recipe was first published in Fri Jun 10 14:47:00 BST 2011.